The 2013 Ford Taurus is new, though it isn't all-new. It's not a new generation, just the current generation at its peak. This latest Taurus has many significant changes for the 2013 model year, all good so far as we can see, from powertrain to interior to exterior, in that order. Three engines are available for the 2013 Taurus. The standard 3.5-liter V6 engine has been updated for 2013 for improved fuel economy, increased power and lower emissions. It's called TI-VCT, for Twin Independent Variable Camshaft Timing, a system that precisely times the valve openings to increase power, throttle response and fuel mileage, while reducing emissions. As a result, the 2013 Taurus gets an EPA-estimated 19/29 miles per gallon City/Highway with front-wheel drive, 18/26 mpg with all-wheel drive. The 3.5-liter V6 with Ti-VCT now makes 288 horsepower, a boost of 25 horsepower over the previous model. A new EcoBoost 2.0-liter engine expected to get 31 miles per gallon on the highway is an option, though not initially. The turbocharged, direct-injection 2.0-liter four-cylinder is rated at 240 horsepower, 270 foot-pounds of torque at 3000 rpm. Keeping in mind that the Taurus is a full-sized car, these numbers make a statement about Ford's commitment to improved fuel mileage with increased power. The twin-turbo EcoBoost 3.5-liter V6 that comes in the 2013 Taurus SHO has been pumped up to 365 horsepower and 350 foot-pounds of torque beginning at a super-low 1500 rpm. SHO stands for Super High Output and this engine lives up to the moniker. The 2013 Taurus SHO engine delivers 17/25 mpg, according to the EPA. Premium fuel is recommended. We got 19.4 mpg running it fairly casually in the city, on a freeway, and on two-lanes; and 17.6 mpg running it hard on a twisty two-lane. The 2013 Taurus also gets a styling makeover, with a new hood, wider grille, cleaner front bumper and fascia, new wheels, new halogen projector beam headlamps, new deck lid, and LED taillamps. Unlike the new 2013 Ford Flex that wiped out the traditional Ford blue oval with chrome, the grille remains Ford's signature three-bar with a blue oval (cool black mesh on the SHO). A new trick is active grille shutters, that reduce aerodynamic drag at highway speeds. The 2013 Taurus has presence: smooth, cool and muscular. Body-colored door handles and mirrors, with graceful headlamps; long horizontal slits for headlamps, that seem like they are as much on the corners and fenders of the car as on its face. Horizontal character lines travel under the door handles and streak rearward at the same level as the headlamps, as if they're an extension of speed. Taurus is a big car, larger than the midsize Ford Fusion and comparing with the Chrysler 300, Chevrolet Impala, Toyota Avalon, and Buick LaCrosse. The interior gets a makeover for 2013 as well, a clean and stylish instrument panel, center stack, and console. Soft-touch materials abound, as fabric, trim, seat cushions and switchgear are all new, and beautifully done. There are rich materials on the graceful dash, and padding on the sides of the center console, where the driver's leg rests and is sometimes braced during cornering. The Taurus is sweetly silent on the highway, thanks to work on sound insulation, namely behind the dash to keep engine noises at bay, in the wheelwells for road noise, and the A-pillars for wind noise. It's quiet also because the engine is so smooth, whether the TI-VCT or EcoBoost. As with other 2013 Fords, the MyFordTouch system of electronic control gets revamped, after being introduced just two years ago. It's standard on 2013 Taurus Limited and 2013 Taurus SHO models, using a terrific 8-inch touch screen on the center stack. Ford owners liked the idea but hated the execution on the 2011 models, so MyFordTouch has been redesigned for 2013 to be simpler. What's more, the new MyFordTouch can be downloaded by dealers into any Ford vehicle that has the prior program. There's no charge for this upgrade/update, a tacit recognition by Ford that the first version was problematic, if not the total mess that many buyers complained about. Taurus SE, SEL and Limited have been moved uptown for 2013, with driving dynamics made lively by electric power steering with a quicker ratio, firmer springs and dampers for more precise cornering, and the new TI-VCT engine with its 288 horsepower. The Taurus SE is a satisfying family sedan with ample power from the 3.5-liter engine. For daily driving the Taurus with the 3.5-liter V6 more than holds its own, including out where the roads weave and wind, which it handles with alertness and stability. The Taurus is not a sports sedan. The ride is comfortable, as the suspension skillfully soaks up bumps. Power from the 3.5-liter V6 is smooth and progressive, with no awkward gas pedal tip-in that many cars with electronic throttles have nowadays. The TI-VCT V6 is even exhaust-tuned to deliver a satisfying little growl under acceleration. The 6-speed automatic SelectShift transmission is seamless and well-programmed. Even in the SE, there's a Sport mode, with manual control using a thumb button on the side of the shift lever. 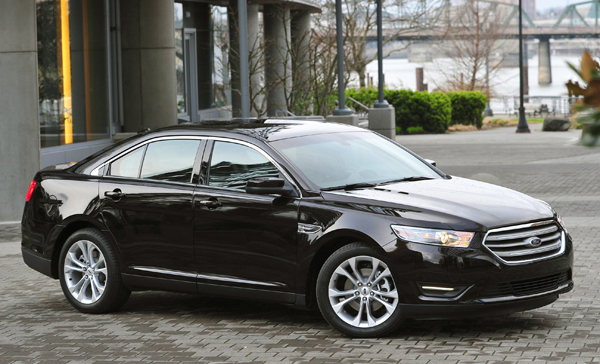 2013 Ford Taurus SE, SEL, and Limited come standard with a 3.5-liter V6 and 6-speed automatic. All-wheel drive is available. The 2.0-liter EcoBoost four-cylinder will join the 2013 Taurus lineup in summer 2012. Taurus SHO comes standard with all-wheel drive and a 3.5-liter Ecoboost engine. Taurus SE ($26,600) comes with cloth upholstery, air conditioning, air filter, six-way driver seat, 60/40 split-folding rear seat, tilt/telescoping steering wheel with audio and cruise controls, AM/FM/CD/MP3 audio with six speakers, three auxiliary power points, message center with trip computer, programmable performance-limiting key, illuminated visor mirrors, power windows with driver one-touch up/down, black exterior mirrors, rear window defroster, capless fuel filler, chrome exhaust tips, halogen headlamps with automatic windshield wiper activation, remote keyless entry, keyless entry keypad, floor mats, and 17-inch painted aluminum wheels. Taurus SEL ($28,800) comes with upgraded cloth upholstery, Sirius Satellite Radio, auto-dimming mirror, leather-wrapped shifter knob and steering wheel, LED parking lamps, body-color heated exterior mirrors, 18-inch wheels, and anti-theft perimeter alarm. Taurus SEL AWD ($30,650) adds all-wheel drive. Taurus Limited ($33,000) upgrades with perforated leather upholstery, leather-wrapped steering wheel and shift knob, rearview camera, heated memory mirrors, puddle lamps, 19-inch premium painted aluminum wheels, ambient lighting, cargo net, MyFordTouch with 8-inch center stack screen, color 4.2″ LCD instrument cluster screen, and power passenger seat. Taurus Limited AWD ($34,850) adds all-wheel drive. Taurus SHO ($39,200) comes standard with all-wheel drive and the twin-turbo 3.5-liter V6 making 365 horsepower. SHO uses a beefier 6-speed automatic transmission with paddle shifters, a sport-tuned suspension, bigger brakes, and 19-inch wheels. The Taurus SHO comes with unique SHO interior trim, pushbutton start, and top-grain leather-wrapped power tilt/telescope steering wheel, aluminum pedals, SYNC voice-activated communications and entertainment, HID headlamps, black mesh grille, black rear spoiler. The optional SHO Performance Package includes brake pads and bigger rotors, quicker steering, stiffer springs and stabilizer bars, specially tuned shocks, electronic stability control with track mode, upgraded cooling, 3.16 final drive, 20-inch wheels with performance summer tires, and tire mobility kit. Options for Taurus models include voice-activated navigation, multi-contoured front seats, rear window power sunshade, auto high beam headlamps, rain-sensing wipers, power moonroof, cargo organizer, remote start, all-weather floor mats, 12-speaker Sony audio, and adjustable pedals with memory. Safety equipment standard on all Taurus models includes dual front airbags, front side-impact airbags, canopy airbags, collision warning with brake support, blind spot beeper, backup beeper, tire-pressure monitoring system, electronic stability control, anti-lock brakes, SOS post-crash alert, traction control, and anchors for child seats. Optional safety equipment includes adaptive cruise control, cross-traffic alert, blind spot information system, and collision warning with brake support. Optional all-wheel drive can enhance handling stability in slippery conditions. Taurus SE, SEL and Limited are satisfying family sedans with ample power from the 3.5-liter engine. For daily driving, the Taurus more than holds its own, including out where the roads weave and wind, as it handles with alertness and stability. It is not a sports sedan. The ride is comfortable, as the suspension skillfully soaks up bumps. The standard 3.5-liter V6 engine gets an EPA-estimated 19/29 mpg City/Highway with front-wheel drive, 18/26 mpg with all-wheel drive. The 3.5-liter V6 with Ti-VCT makes 288 horsepower. Power is smooth and progressive, with no awkward gas pedal tip-in that many cars with electronic throttles have nowadays. The TI-VCT V6 is even exhaust-tuned to deliver a satisfying little growl under acceleration. The 6-speed automatic SelectShift transmission is seamless and well-programmed. Even in the SE, there's a Sport mode, with manual control using a thumb button on the side of the shift lever. Taurus SHO has a different character, featuring the twin-turbocharged, 365-horsepower EcoBoost engine, which continues to prove itself, pounding a spike in the coffin of the V8. The EcoBoost V6 has the acceleration and torque of a V8. It may not have the full V8 rumble, but the V6 exhaust note through twin pipes does growl. If you drive a steady 65 mph, you'll get 25 mpg. We got 17.6 mpg during three hours of spirited, hammer-dropping driving through the forgotten forests between Portland and the Oregon Coast. To counter the SHO's go, there's a new brake system with a larger master cylinder, revised booster tuning for improved brake feel, and upgraded friction material for additional resistance to fade. We used the brakes hard, and they felt wonderful, strong but not too sensitive, with a progressive feel to the pedal. Even the ABS felt smooth, without much vibration in the pedal, when we did a panic stop to test them. The 2013 Taurus comes with a new electronic power steering system, with a quicker steering ratio in the SHO. In the curves and switchbacks, the steering sometimes feels behind the car, like it's just guiding the wheels, not forcing them. The handling can feel a bit floaty, even with the SHO's sport tuning of the suspension. Which by the way is jouncy, dancing around when we drove it hard over the undulating and twisty two-lane. Once we hit a bump while turning and one front wheel lost traction. Over patchy pavement in town we found the ride was not harsh or uncomfortable in the SHO. We loved the smoothness of the 6-speed automatic transmission, which in the SHO is beefier than in the other models, in order to handle the horsepower. And we loved the perfectly designed paddle shifters, especially compared to the awkward non-ergonomic button on the shift lever of the others. But the programming in Sport Manual mode was intrusive, and baffling. It not only shifted itself, but at the wrong times. We came racing up to a curve at 4000-5000 rpm in second gear, and lifted the throttle to use engine compression to slow down, but the transmission upshifted to third so we needed to use the brakes to slow the car. Another time, we revved to redline 6500 in 2nd gear and upshifted to 3rd gear; then, still at full throttle, it almost immediately short-shifted itself into 4th gear at a lower engine speed than we wanted. This is the kind of thing that turns a sports sedan driver off, and makes him or her not want to bother with a car. It's not your car, to drive how you want, it's some transmission programmer's. And frankly you know better than he or she does. By the way, the rev limiter is not intrusive. No abrupt cutout of spark, the engine doesn't fall suddenly on its face, it just hangs there at 6500 and revs no higher, limited by fuel. We don't mean to question Ford's dyno numbers, but still: the EcoBoost twin turbo V6 makes 350 foot-pounds of torque at 1500 rpm, all the way up to 5000 rpm, according to the stats. So we floored it in 6th gear at 1500 rpm, with the transmission in Sport Manual mode, and it kicked down on its own, all the way down to 3rd gear. If it's got all that torque at 1500 rpm, all the way to 5000 rpm, what's that surge we feel at 4000 rpm? Not that the surge is bad, we're just asking. Finally, there's Torque Vectoring Control, which uses the electronic stability control module to monitor the dynamics of the car 100 times per second; when the front inside wheel starts to slip in a corner, brake is applied to that wheel, balancing the grip with the left front wheel and reducing understeer. Torque Vectoring works with Curve Control, which is like electronic stability control, only quicker; it senses when a vehicle is entering a curve too fast, and cuts power and/or applies braking to individual wheels to reduce speed by up to 10 mph in one second. Think freeway on-ramps or off-ramps, especially in the wet. Like the Taurus, the 2013 Ford Flex comes standard with Torque Vectoring and Curve Control; we drove the Flex over these same twisty roads on the previous day, and didn't feel Torque Vectoring in action. But we tried harder with the SHO, especially to make it oversteer (tail out) and understeer (plow), but we couldn't do it, because of something magical and invisible keeping us aligned, which we presume to be Torque Vectoring and Curve Control working as it was brilliantly intended. Substantially revised for 2013, Ford Taurus is a solid family sedan, smooth and quiet underway. There's ample power from the standard 288-horsepower 3.5-liter V6 engine, which feels smooth and sophisticated when pulling from intersections but growls under hard acceleration. The 6-speed automatic SelectShift transmission is seamless and well-programmed. The ride is comfortable, as the suspension skillfully soaks up bumps, and the Taurus handles roads that weave and wind with alertness and stability. Torque Vectoring Control and Curve Control help keep it on the road, and all-wheel drive is available for slippery conditions. The Taurus SHO delivers V8-type acceleration performance from its Ecoboost V6. Sam Moses filed this NewCarTestDrive.com report after his test drive of the Taurus SHO near Portland, Oregon. Head/hip/leg room, f: 39.0/56.3/41.9 in. Head/hip/leg room, r: 37.8/55.8/38.1 in. Cargo volume: 20.1 cu. ft.